Let’s talk cake pops. 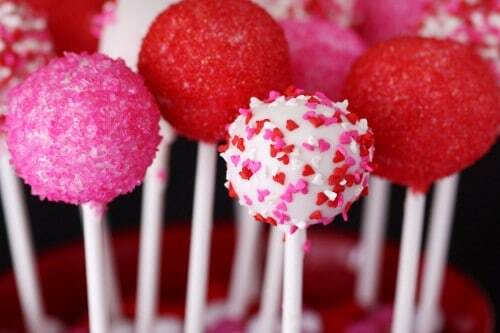 Cake pops have without a doubt become one of those most popular sweet treat trends in years. We have the wonderful Bakerella, Angie Dudley, to thank for introducing us to such a fun treat. Whenever I show up at a party or get together with cake pops, they are always very well received and very much enjoyed. 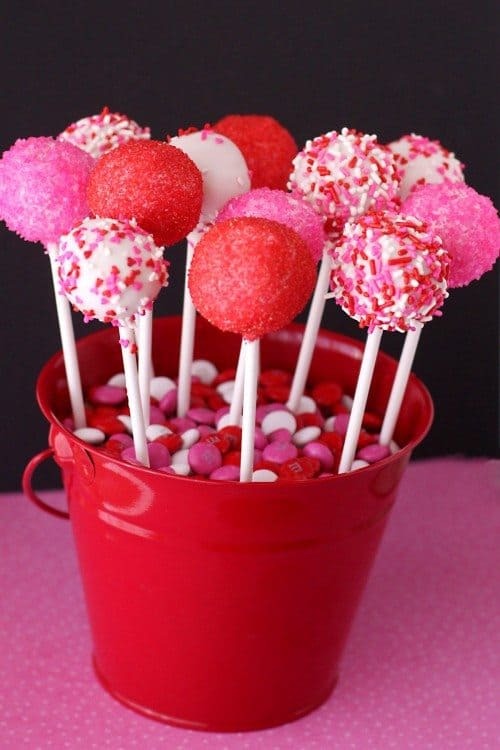 While cake pops are certainly a fun treat to share and eat, they can be a challenge to create. 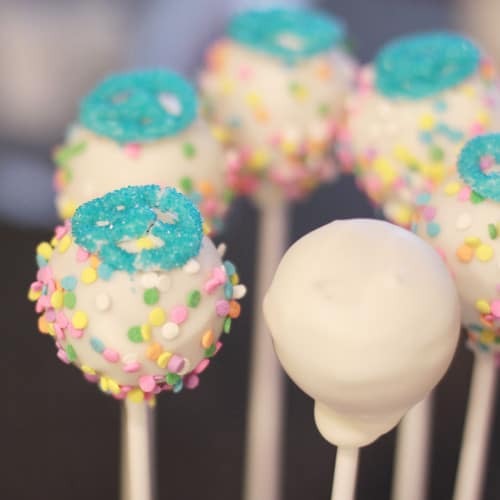 I am by no means an expert cake pop maker, but I have spent some time making cake pops using three different methods, and thought I would put that information together in one post, as well some great resources on other sites to help you in creating cake pops. I have three different methods I use to make cake pops. In the photo above you see my cake pops (left to right) made using the Babycakes Cake Pop Maker, the My Little Cupcake Cake Pop Mold and what I call the original method, using a baked cake and frosting mashed together and shaped. My preferred methods are with the Babycakes Cake Pop Maker or the My Little Cupcake Mold. If I need to make a lot of cake pops, I always go with my Babycakes. If I’m making a small batch and want to spend a bit more time decorating to them, I go with the My Little Cupcake Molds. A big plus to the My Little Cupcake method is that you can do it without baking anything. And that leaves us with the original method. I have been pretty honest that I just do not love the original method. I don’t know why – I mean I love cake, I love frosting, but together, it just doesn’t do it for me. I will say that original cake pops made with homemade frosting taste worlds better to me than canned frosting. The plus side of this method is you don’t have to buy any equipment. The downside to me is having to bake a cake first to make them, and I’m often so pressed for time, that this extra step is enough to make me go another way. One thing each method has in common is that once the ball or shaped cake is prepared, it needs to be dipped in chocolate and decorated, so we will spend the rest of this post focusing on that aspect. I have written a fairly extensive post about the different types of chocolate you can use for dipping your cake pops (and other items) in, and you can check that post out here. 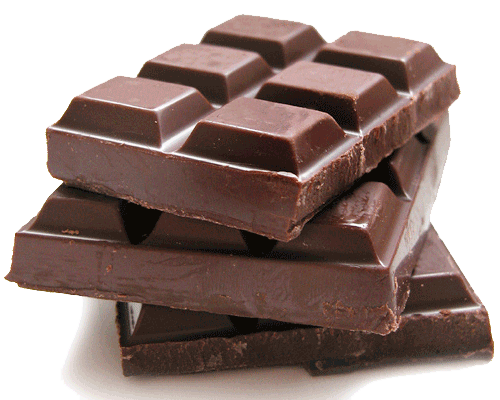 I find each brand of chocolate coating to be quite different, and if you want to know my take on them, make sure check out this post that goes in to much more detail about melting and working with chocolate. 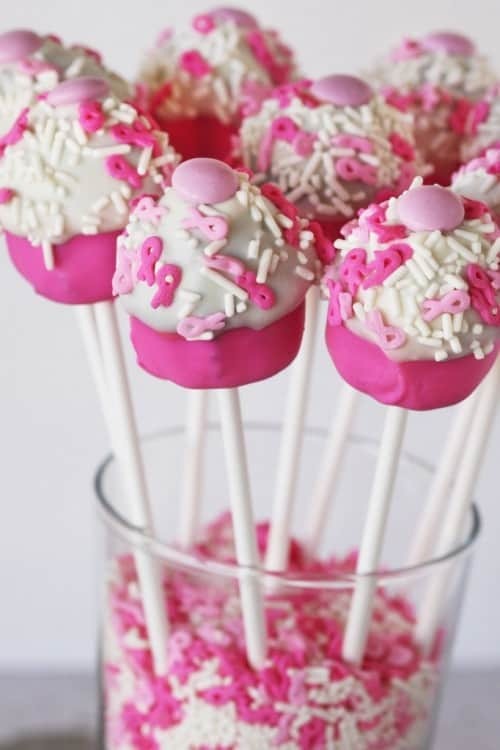 First things first when it comes to decorating your cake pops – you need to get them onto a stick. You can get your sticks in different sizes, with 4 inch, 6 inch and 8 inch being the most common. I tend to use the 6″ or 8″ sizes. No matter what kind of cake pops I am making, I always dip my stick into the melted chocolate, and then put my cake pop on it, and then let the chocolate set, usually in the fridge or freezer. Skipping this step has never, ever, worked for me, and almost always results in my cake pop jumping ship and taking a swim in the chocolate. I never make cake pops (or chocolate covered marshmallows, or cookie pops or ANYTHING on a stick) without doing this. After I have all of my cake pops on sticks that have been dipped in chocolate, I then put them in my freezer. Chilling them helps set the chocolate and make the stick, chocolate and cake all come together like a happy little sugar filled family. Chilling the cake pops also helps set your chocolate more quickly when you dip the cake pops (so you don’t spend 20 minutes waiting for each cake pop to quit dripping chocolate). Another way I deal with this issue is that I do a “first dip” into chocolate, not add sprinkles, and let it sit. I then redip them in a second layer of chocolate, and decorate. Kind of like a crumb coat in frosting a cake. This sort of seals the crack into the first layer, leaving the second and outer layer looking nice and pretty, and yay – more chocolate! This is also an option if you make your cake pop and the chocolate hardens before you get the sprinkles on it. Just dip it again! My other solution is my solution to many decorating challenges – I just completely coat them in sprinkles. I find sprinkles hide a lot. For as much as I bake, I am not a decorator, I’m just really good at liberal use of sprinkles. If you notice a big crack after you’ve already added your sprinkles, you can add more chocolate, either by drizzling it on or even using a toothpick, and then topping it with sprinkles. Or go for an artistic drizzle of chocolate all over, which will help hide the cracks. Dipping my cake pop sticks into the chocolate, then putting them into the cake pops and letting the chocolate set has helped this problem for me immensely. I do have a few other things that help with this issue. 1. Don’t make the cake pop too big. I’ve seen some giant cake pops. They look delicious, but I feel like they are flirting with gravity. I keep my cake pops on the smaller side. For those that have seen the cake pops at Starbucks, mine are always smaller than that size, and are never as big as a golf ball. Too much weight on that tiny stick has the potential to create problems. 3. I never tap the stick on the side of the bowl too hard when trying to get the excess chocolate off. Too hard of a tap and bam, cake pop in bowl. I tend to do a very gentle tap or two on the side of my bowl, and then twirl my cake pop, slowly and constantly, over the bowl to let the excess chocolate drip off. I also twirl my cake pop slowly. I’ve seen some videos of people whipping their cake pops around, and that’s not worked out well for me. 4. Holding on to the cake pop until the chocolate is close to set. Once the chocolate sets, usually the cake pop and stick are pretty good friends. When I rush it and stick my cake pops into my holder or styrafoam too fast, this is when I’ve sometimes had a problem. 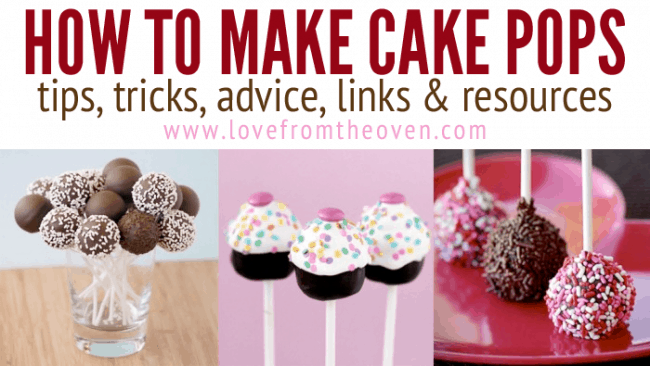 For me, many of the tips listed above help lead to a smooth and even coating on my cake pops. Another helpful tip is to use paramount crystals. This helps to thin out the chocolate. I talk about paramount crystals more here. I have an “always keep moving” thing when I make cake pops – the slow twirling of the cake pop until the chocolate sets. It’s a bit of a balancing act to find when to add the sprinkles and when to put the cake pop down. If you put the sprinkles on too soon, they can slide off and take the chocolate with them. Wait too long and they won’t stick. There is definitely a sweet spot time wise to adding the crystals, and I think a lot of it just takes some practice and patience to find what works. I like to stick to lighter sprinkles when I make my cake pops, the ones that weigh the least, such as sanding sugar, sugar crystals, jimmies and the like. In find the sanding sugar and sugar crystals are the easiest. When I see cake pops decorated with M&M’s and chocolate chips, honestly I have no clue how they are doing that, though I’m pretty sure it probably requires more patience than I have. I will be going into more detail in upcoming posts about the different ways I create the actual cake part of the cake pop, but hopefully some of the information here can be helpful. Make sure to check out the great links and videos – they are really helpful! Do you have any tips or tricks you’d like to share? These are great tips! thank you so much. Thank you so much for including me in your Cake Pop info.! I loved your chocolate post. wow, that is the best guide ever. I made my first cake pops few days ago but I made all these mistakes. with the help of your guide, I’ll guess I’m making another batch tomorrow. only better one. I came to your site looking for some troubleshooting ideas, which I have gotten a lot, thanks. Then I saw your pops w/ the sprinkles w/ the cancer ribbon….can you tell me where you got those? I do the Relay for Life and would love to sell some pops w/ these on them. hi i have a problem make cake pops, i do all the steps and finally the chocolate coat breaks in the cake pop. i really dont now what iam doing wrong. 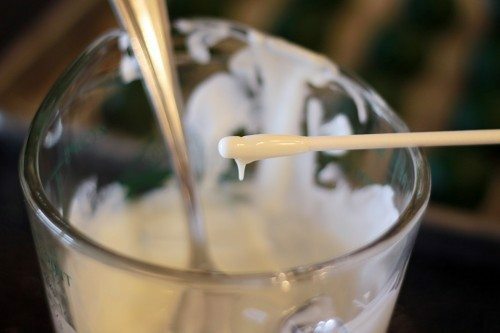 If you find that your candy melts/chocolate is thick or gloppy (especially with melted chocolate chips), add a little crisco! Crisco is my answer to everything. It works with just about every issue you may have! Just add a 1/4-1/2 teaspoon of crisco and the consistency will be a lot smoother and easier to dip! 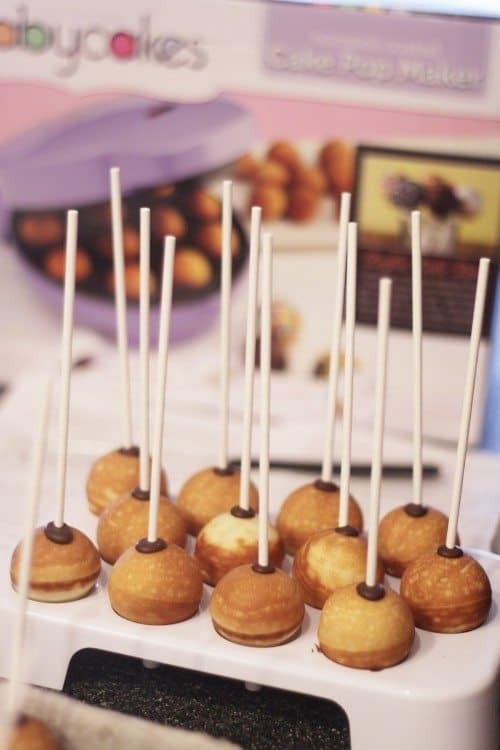 Loved your post about cake pops so much that I posted a link to it on my blog! Just wondering how long a head of time can you make the cake pops if they have been iced and can you use any cake mixture or is a sponge cake the best option due to weight? Kristie, by iced do you mean dipped in the chocolate coating? If so I usually say 2-3 days, I really prefer them as fresh as possible. I think any kind of cake is fine, the texture is mainly going to come from the ratio of cake to frosting that you use when you mix them together. My method is start out with a little frosting and go from there, always easier to add more. 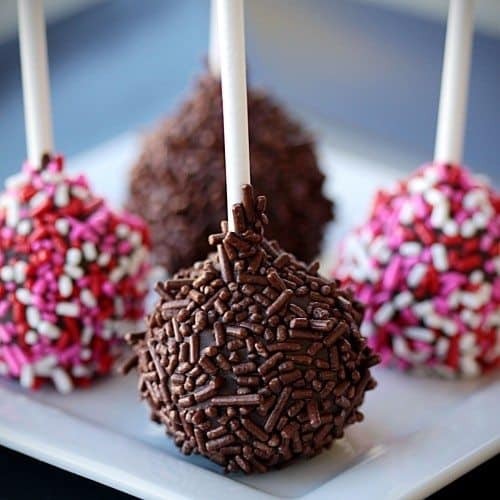 I’m always afraid the cake pop will fall off the stick when I dip, so instead of dipping, I scoop up chocolate with a spoon (a regular one, nothing special) and twirl the cake pop around in it until it’s coated. Hope this helps. I love your sense of humor. Must admit, I haven’t tried making them yet so my question might be silly, but… Can I use a thin’ish icing with powdered sugar, whipping cream and a flavored extract for coating my pops? Claudette, I think you want something that is going to harden and become solid for cake pops. I mean in theory, you could use anything, but if you want to transport them and not have them be a mess, then the chocolate coating is the way to go. I’m sure a thin downed glaze would work, almost like what you see on donut holes. But your idea does sound yummy! Hi,thank you so much for the very helpful tips. I can’t believe how frustrating it can be to making this little yums. I just made my first batch of cake pops, using asstd. cakes n frostings. But i enjoyed every minute of making it. I guess i made it too big. My last cake will be way smaller n not too heavy for the stick to hold onto. itll probably be a lot better.I hope to finish the last batch tomorow. I still have to practice more. Thanks again! Living in the tropics means chocolate coating does not set. Can anyone tell me how I can coat the cake pops in something that will harden and set? Julie, what types of chocolate coating have you tried? And BTW – this blog is awesome! Thank you for sharing all of this information so beautifully and thoroughly. I have it bookmarked to refer to whenever I pull out and use my Cake Pop Maker. Love it!!! 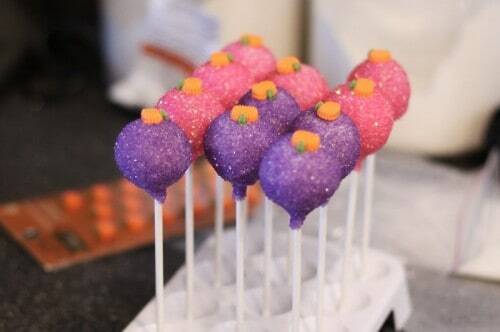 I stumbled upon your site when searching on how to frost cakepops. So, they have to be frosted in chocolate? I actually made a green velvet cakepop earlier because I never seem to have red. I lucked up and found a babycakes set at Sam’s Club, and I hace used regular cake mix with great results!! I was having difficulties though, and I appreciate your tips and advice. Thank you so much!!! Thanks for your tips. 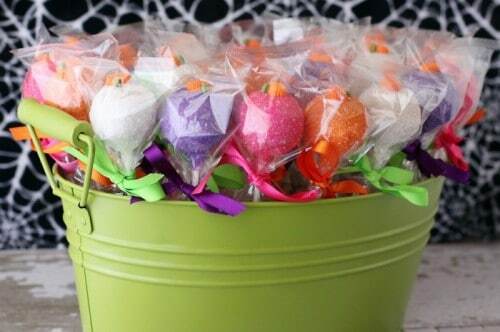 I am planning to bake at least 300 cake pops for my daughters sweet 16. I will need to make them in advance for I will not have the time to do it. I was hoping to just make the cake pops and freeze the balls only for a couple of weeks then defrost them a couple of days prior to our event and place the sticks and decorate them. I know cake pops are best fresh. I was hoping for your opinion. Also I plan on freezing them in vaccum sealed packing that has always worked great with other items I’ve had to freeze. Thanks so much! 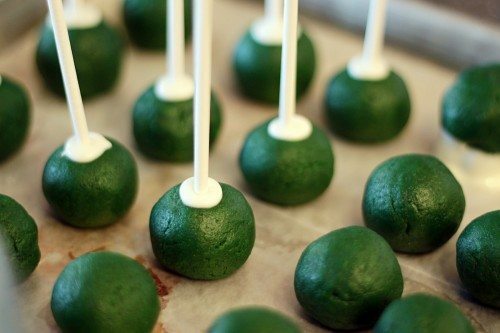 I am a new cake pop maker and decided I should read up on making them before I try and make 30 of them! Thanks for the great tips and advice!!! 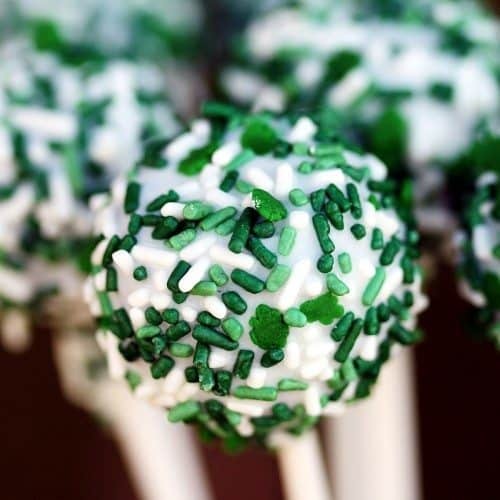 I am going to make some cake pops for St. Patty’s Day. I tried Bakerella’s Snowmen for Christmas and they didnt work out so well…so we will see how it goes this time. Thanks for the tips! This was very helpful! Thanks so much for the tutorial, this is bound to come in handy! I am going to attempt to make my first pops and actually want to make them look like horses. I’m trying to find information on how to do this exactly, but haven’t been successful. Have you ever done the shaped pops? Laura, I’ve pretty must stuck with round ones, I’m not sure that my skills would pull off much more! My Little Cupcake has some great molds though and that is the way I’d go for shapes. I made my first set of cake pops today, and getting them on the sticks and staying on the sticks was a real challenge as before I had even started to decorate them they had fallen down the stick!! Then the ones that did survive that stage then decided to fall off in my chocolate, it was not going well at all, I abandoned this set and made a new set following your helpful dip the stick in chocolate tip, and it worked at treat! Thank you so much all my problems are now solved!! Hi I have made cake pops only once before thanks for your great website. Thanks for the tips! I recently bought a cake pop mold from Keetzen in Amazon. My daughter and I are psyched to try out new recipes and ideas. So far, we’ve made vanilla based batters and they came out pretty good! can’t wait to try these out!